Last post on Chiang Mai – finally! I’ve uploaded so many photos (377!) to my Flickr and it’s taken so long that it feels like the trip was ages ago. The trip was fantastic…but I’m going to be glad to go back to my regular food photos! This final post will again be on various memorable food photos that didn’t make their own blog posts. 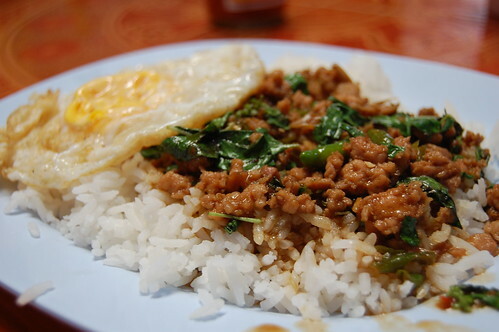 This pork, chili and basil dish on rice, with a fried egg on top, was eaten at a tiny restaurant outside Wat Doi Suthep, the temple on the mountain overlooking Chiang Mai. We had gone there as a group of both us foreigners and one Thai visitor from Bangkok whom we had met at the workshop we were attending. She too had not been to that temple. Just before lunchtime, she started talking about how she wanted to eat pork with basil for lunch. And she went on and on and on and then we all wanted the same thing! We could already taste it! And when we ordered it at the restaurant, it was fantastic! 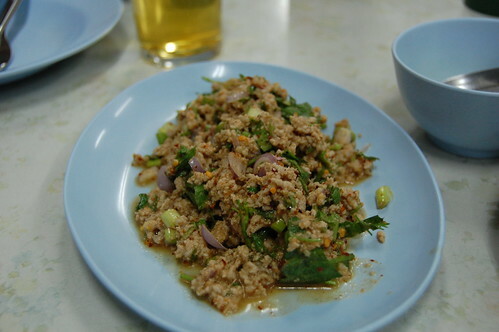 Loads of salty fish sauce and hot chillies and fresh basil – and the egg on top! Wow! 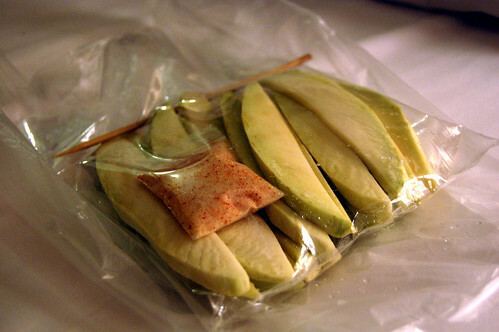 That night, I picked up a bag of sliced green mango with a smaller baggie of salt and sugar and chili powder. 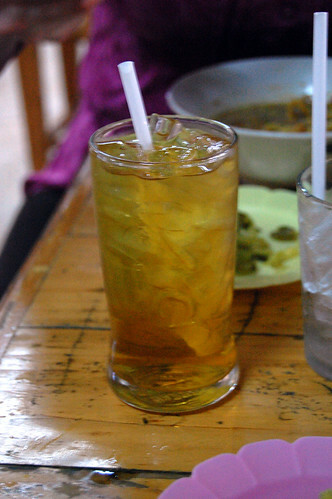 I loved this non-sour green mango that reminded me of a crunchy guava and the chili mixture went very well with it – it was commented that it was like a Thai fizzy sherbet! And this one is added to my long list of “I wish I tried that”! 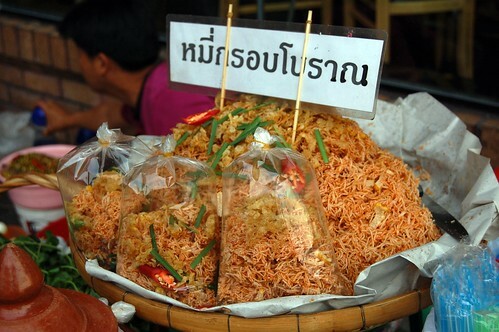 This pile of mee krob (fried rice vermicelli in a sweet and spicy sauce) looked so appealing. 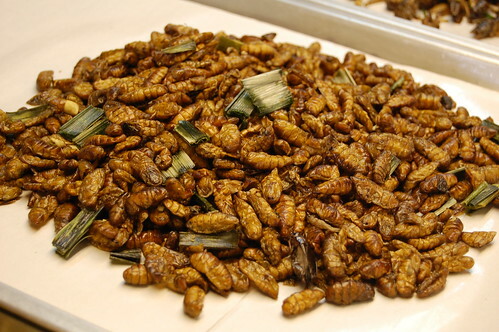 I suppose I could have purchased a bagful of this to take home (I saw it on the day I flew back). 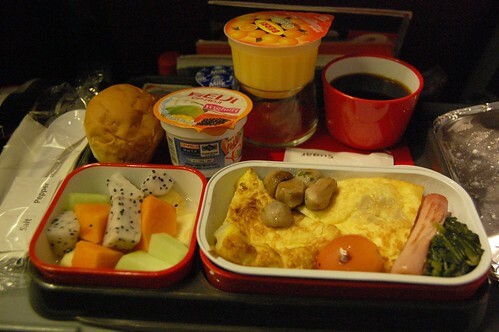 Finally, I’ll end this Chiang Mai series with my Qantas breakfast en route from Bangkok to London. I had a horribly long stopover at the airport in Bangkok as this connecting flight was delayed. I was exhausted and ended up missing the first meal (I really didn’t want “supper” at 4am) and woke up just before this breakfast before landing in London. The fruit bowl was nice, as was the yogurt, surprisingly. The cooked meal was, quite frankly, awful. 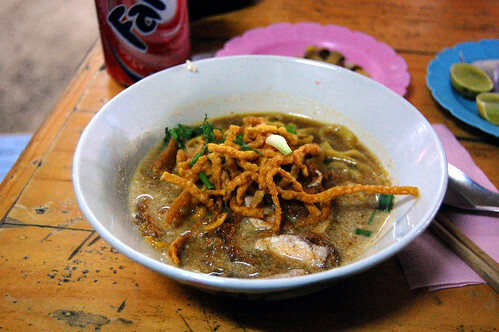 After reading such delectable recommendations from EatingAsia and on eGullet, I knew that I’d have to fit in a trip to Lamduan to eat their famous kao soi. I only managed to find that time on my last day in Chiang Mai, after a visit in the morning to the ruins of Wiang Kum Kam, the previous city to Chiang Mai. We grabbed a table next to a fan and were presented with English menus. We each ordered a small bowl of kao soi, a total of 3 with pork and 1 vegetarian. The pork one was a revelation, much better than the version I had at buffet place. The focus was obviously on the curry rather than the coconut milk and it was deeply savoury and spicy but not at all hot with chili. On the side, your temperature can be risen with the addition of roasted red chili oil and little limes, raw shallots and pickled vegetables are the other traditional accompaniments. The noodles within the curry soup are egg noodles and the same are deep fried and used as a garnish on top. Both roasted pork and fried pork scratchings featured in the soup, the scratchings half crunchy and half soaked with the delicious soup. 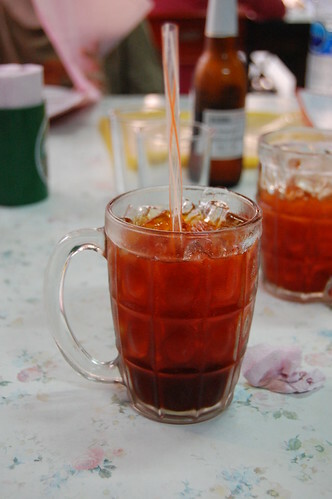 To drink, I chose the longan juice, which turned out to be boiled dried longans with sugar added. These dried longans were sold all over Chiang Mai and I bought a mixed bag of them and lychees to take home. The chewy orbs are tasty eaten out of hand but when we get tired of them, I might boil up this drink. The best part about having a small bowl of noodles is that there’s plenty of space in your stomach for other goodies. 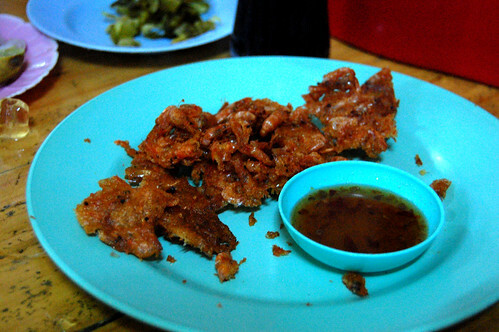 After a quick perusal of what’s on offer, I chose these shrimp fritters, tiny little red shrimp in a batter and served with a sweet chili sauce. Very addictive. 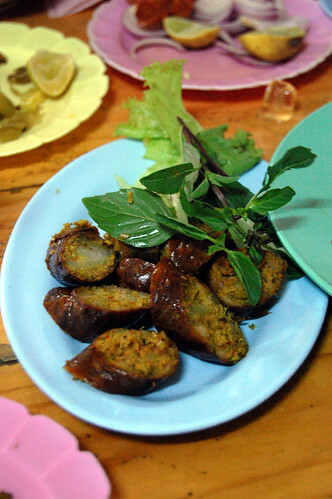 We also wanted to try their spicy Chiang Mai sausage. Long coils of it sat in the kitchen and orders were coming out fast. This one was full of herbs and chili and was the most spicy sausage I’d eaten on this trip (and I could make a joke here about eating a lot of sausage but this is a nice food blog, people). The sausage’s cross section shows us lumps of sticky rice scattered throughout the meat that gave a nice textural contrast. For the four of us, we had ordered the sausage, the fritters, 4 drinks and 4 small bowls of kao soi and this came to about 200 baht altogether. That’s less than 4 pounds. Highly recommended! 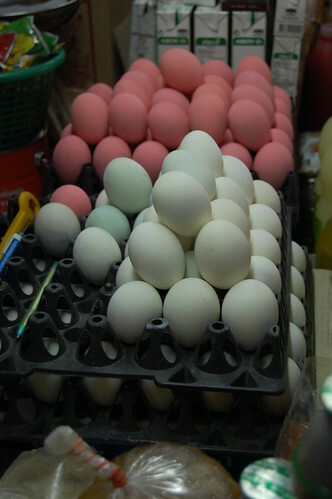 When in Chiang Mai, do make time to visit Lamduan. I only wish I’d have visited earlier so I could have had their kao soi more than once! They’re not open for dinner and it’s packed with locals for lunch but there’s plenty of seating and turnover is quick. So, onto the actually cooking at the school! After the visit to the market, we had another 30 minute ride before we got to the Thai farm, where the cooking school is held. After a short demonstration on how to cook sticky rice, we put on aprons and straw hats (absolutely necessary in the sun!) before taking a short tour of the farm itself and saw how Thai aubergines, basil, Thai parsley, lemongrass, and other various fruits and herbs grew. As our teacher has a little paring knife with her, we also got to taste all the raw ingredients with which we would be cooking. I really found this to be one of the highlights of the class and it was the main reason I chose this course over the others held in Chiang Mai city. Oh, and they’ve recently changed the format of their courses and on any day, you can choose the dishes you’d like to cook from this menu. 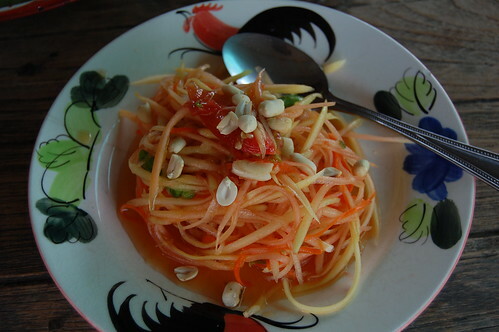 and the green papaya salad (som tam – so refreshing with a dressing of garlic, chili, fish sauce, lime juice and sugar) and we had these first dishes with white rice and sticky rice for lunch. There’s a bit of a story with the curry paste. 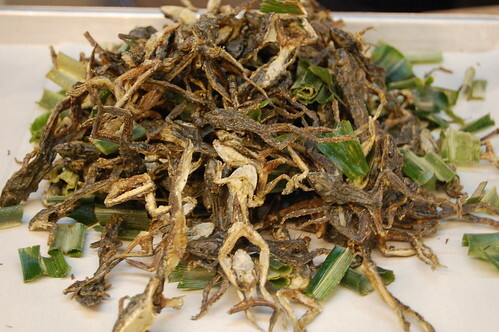 At the market, we were shown some fermented prawn paste, a soft, dark pungent paste that’s similar to the Malaysian belacan but not exactly that. We were told that it’s normally added to all curry pastes but that we weren’t going to use it as many foreigners did not like it. What?! 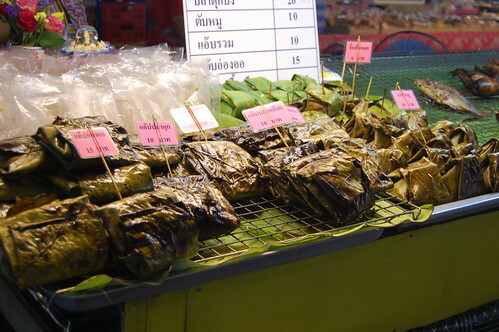 I made it a point to purchase a little bag of paste at the market (it was only 5 baht) and added it to my green curry paste with the guidance of the teacher. 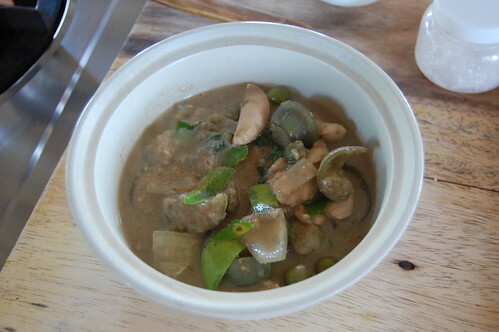 It gave it a wonderful flavour and a slightly darker colour as well. 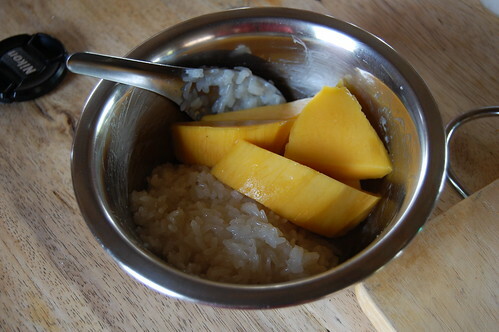 and mango with sticky rice (so much easier than I thought it would be! It’s sticky rice mixed with coconut cream and sugar). As we were stuffed from lunch, we packed these up into plastic bags to take back with us. By this time, it was almost time to go home and we were all given some lemongrass tea and a little recipe book with all the recipes from the menu. 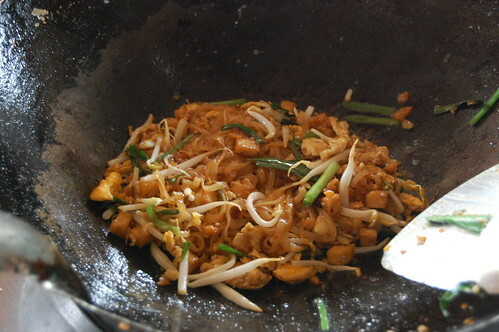 I’m already being pestered to cook pad thai at home and that is what I plan to tackle this weekend. I highly recommend this school – it’s nice to get out of Chiang Mai a little when you’ve been there almost a week. You will, of course, be expected to know basic cooking skills such as using a knife though instructions on stir-frying with a wok are given. A one day course costs 900 baht and starts at 8:30 to 9:00 with a pickup at your hotel and a dropoff time of about 17:00. I’d heard that cooking schools in Chiang Mai are a dime a dozen and after getting a recommedation from Boots in the Oven, I signed up for a day’s course at the Thai Farm Cooking School. 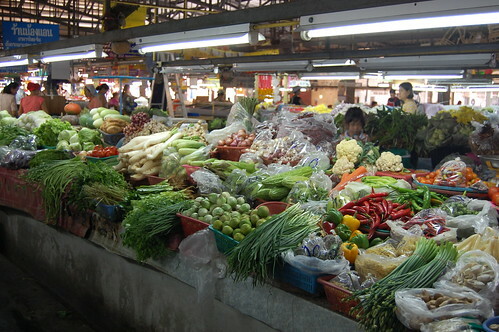 After being picked up from our respective hotels, we’re first brought to Ruamchook Market, a medium sized food market about 20 minutes drive out of Chiang Mai. 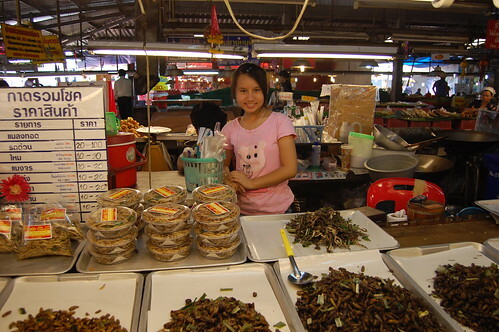 I adored this market – favouring it to the markets in Chiang Mai. There’s a slower pace to the market that allows one to slowly walk from stall to stall at one’s own pace, without the crowds pushing against you. We only had about 10 minutes for a quick lookaround though and I’m showing the few food photos I managed to take. and lots of ready to eat, prepared foods. Can’t tell what they are? Click on the photo for a closer look and the answer. I may have gone slightly overboard with photo taking during my trip to Chiang Mai and I thought I’d share some of the other food highlights that didn’t make it into their own blog posts. 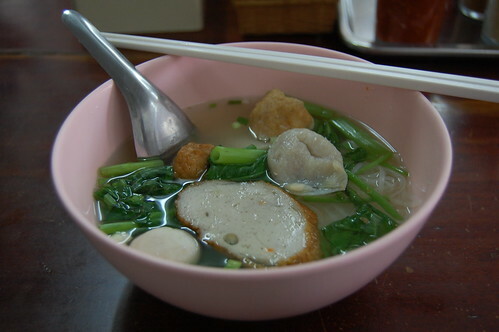 These fish ball noodles were my first lunch in Chiang Mai and gave an indication of the good things to come. 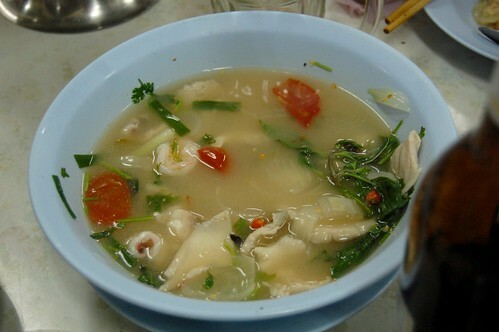 At only 30 baht (50p), this was a generous bowlful of rice noodles, a variety of fish cakes and fish balls (all with different textures), and morning glory. While the broth was very soothing, I was looking for something a little more exciting and punched it up with the various condiments on the tables. A little of that chili powder and wow! 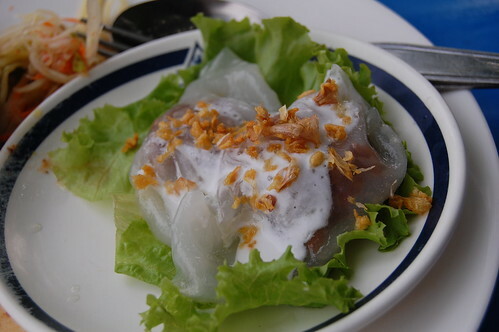 This was a steamed sticky pancake filled with pork and peanuts, topped with both coconut cream and fried garlic. The skin was like that of the dim sum dish har gow and while the peanuts weren’t apparent, the whole combination just sang in my mouth. 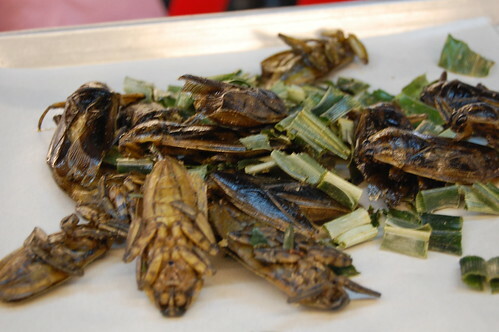 I had this at the Nangnual Seafood Restaurant’s lunch buffet, part of a trip organised by the workshop I attended. The manager there took me under his wing and pointed out all the northern Thai specialties that I absolutely had to try and helped me with which garnishes to eat with them – and the garnishes are the most complicated part! 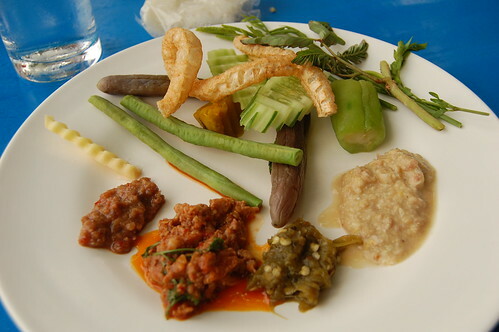 Still at the lunch buffet, I tried their full spread of dips and raw vegetables, again another typically northern Thai spread. Click on the photo for labels for each item. On the last day of the workshop, we were brought to the Chedi Chiang Mai, an extremely beautiful and expensive hotel, for a dinner reception. 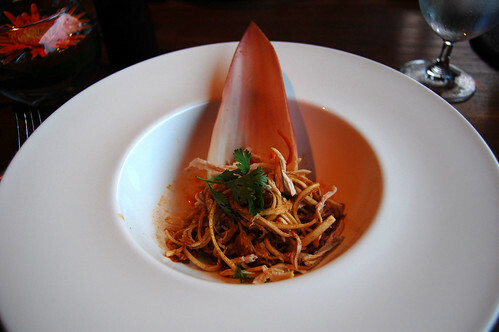 The highlight of the meal was this banana flower and chicken salad – both meaty and refreshing at the same time. Not Chiang Mai related but I just wanted to direct you to my latest Shoot and Eat entry on Canteen at Londonist! One night, there was talk of going to a cultural show to have dinner and see some dancing. I can’t say I was particularly thrilled as my experiences of these “experiences” have never been good. However, when I learned that these dinner/shows are also frequented by Thai tourists, I realised that perhaps it wouldn’t be so geared towards foreigners. Off we went. It was a definitely a slick operation as they’d sent minibuses to pick us up from the hotel. When we entered the room, we were led to a large table since we were a large group; those who arrived earlier were seated around lower tables on the floor. 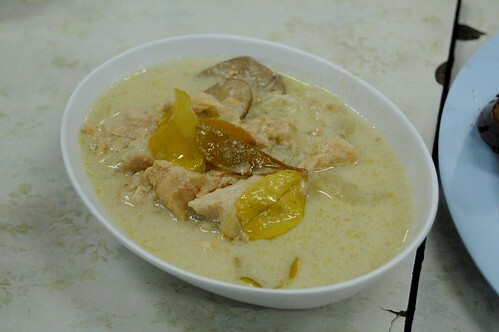 This Khantoke dinner was presented to us as soon as we’d settled in – this style of eating is a traditional northern Thai (Lanna) form of eating. 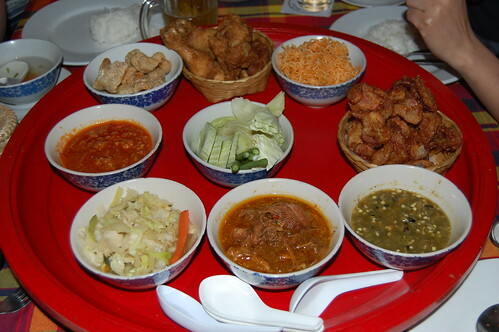 A low round tray is set in the middle with a number of dishes laid out on it and people sit around it. 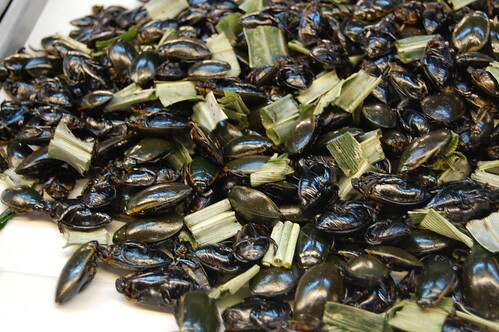 Sticky rice is eaten alongside the food and everything is usually eaten by hand. We stuck to forks and spoons though! Servers came around during the meal to refill any dish that we’d finished. Clockwise from the top, we have: fried chicken, mee krob (fried rice vermicelli in a sweet and slightly spicy sauce), fried bananas, green chili and aubergine dip, Burmese pork curry, stir fried cabbage, chili and tomato and pork dip, fried pork rinds (to dip), and in the middle, raw vegetables (also to dip). There was also a vegetable soup to start, both steamed and sticky rice to eat with, and fried sweet crispy rice cakes for dessert. Nothing was spiced too heavily, I’m guessing for the palates of the foreigners but there were still a few dishes that stood out for me. 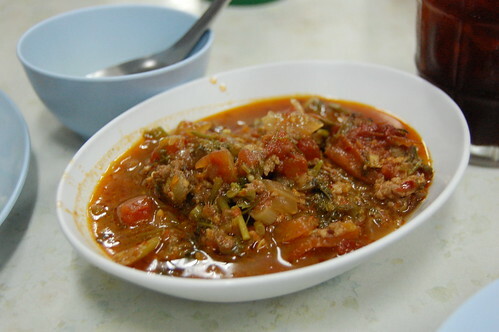 They were the Burmese pork curry (very nice – deeply savoury and good with sticky rice) and the chili, tomato and pork dip (mmm….dippy goodness). I found this surprising as I don’t usually expect much from mass produced food. 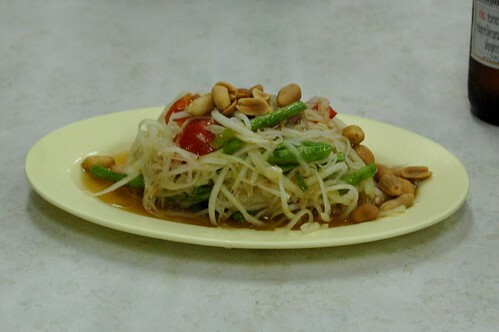 Further information about khantoke dining can be found in this article. Oh, and the entertainment was good too! Photos from the shows can be found on my Flickr photostream. Just before I left for Chiang Mai, I found this video online of Anthony Bourdain spending time there for A Cook’s Tour. He went to visit a number of eateries but what really caught my eye was his time at Aroon Rai, a restaurant where he said that everything’s good. With his stamp of approval (and his going on and on about how delicious everything was! And our tailor also giving it a thumbs up! ), this place was chosen for dinner the next night. No coconut for me this time; instead I started with some iced lemon tea. This led to a bit of an addiction to lemon tea during my entire visit. 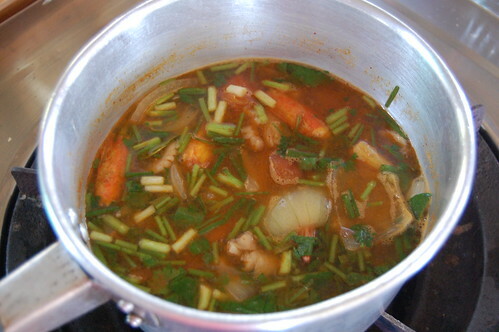 and a few vegetable dishes to round things off. While the presentation wasn’t as impressive as at The Good View, I found this meal to be the most memorable. 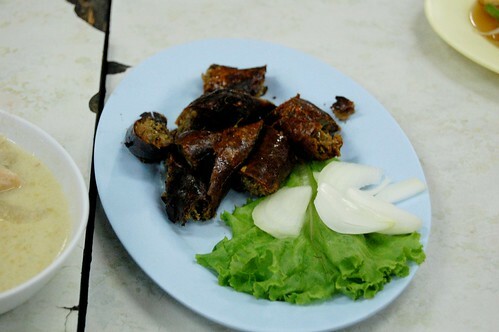 It’s true – everything was extremely good and I know that if we had been able to convince them to add more chilies to the food, the meal would have been even more memorable (maybe not in a good way!). Highly recommended!